Maintaining what has become the norm for the Halo Championship Series, Splyce walked away as the champs of New Orleans. They did not have an easy road. The most interesting series to watch was Splyce v. Elevate. Elevate definitely came to make a splash, this series was full of bare knuckle standoffs. There was a lot of talk, especially from the broadcast team, that Splyce was not playing at their best. I have to admit there were moments where it felt like true effort was lacking or they were simply out of their element. During the best of seven bracket reset in the grand finals Tox took the whole thing 4-0 with little effort. 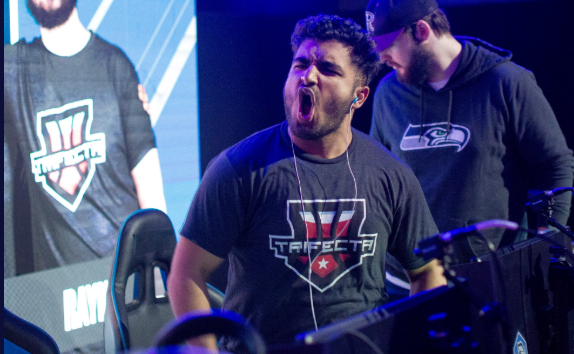 The new maps proved to be a bit challenging for Splyce early on in the tournament, but that seemed to fade away as they started locking horns with Tox. While Tox put on a hell of a show, they ended up falling short when it mattered most. “YOU CAN’T LET HIM DO THAT!” Above is a quote is a quote from Golden Boy in regards to Trifecta’s Musa who was a juggernaut of slaying momentum. Musa was by far one of the most frightening, fresh blooded players at NOLA. He was dealing massive damage, responding to call outs with ravenous blood thirst and having a damn good time doing it. Musa is a beloved favorite in the local Toronto gaming scene and it’s not hard to see why. Performing with the deadly consistency HCS fans have come to expect was Shooter. Ryanoob had this team sitting pretty by putting up huge assist numbers while Rayne displayed terrifying talent with the sniper rifle. I spent some time with their young and very ambitious coach Jake Bain on the floor. Like the rest of his team, he sets high standards for himself and has a hunger to be on top. Considering these guys have only been a team for a couple months, I’d say they were pretty damn successful at this event. Me hanging with Trifecta Coach Jake Bain and Reciprocity Manager Martin Omes. When talking about Trifecta I can’t not mention Reciprocity because these two teams had a proper showdown on Sunday. This series is easily number one on my re-watch list. The final round ended 49 to 50 in favor of Trifecta. I’ll be honest, my money was on Reciprocity who was delivering solid performances all weekend. Also on the floor was Reciprocity manager Martin Omes who took to the time to speak to me about Rec’s heavy focus on communication and I would say it paid off. Favorite to Watch: D3MON_D Amid the mad roster shuffle a new impressive squad emerged calling themselves Hitmen. A handle that works pretty well considering the lineup. You’ve got Ace, Bubudubu, Artic and my new favorite slaying machine, D3MON_D. Musa may have made a big splash but there is something about D3MON_D that is downright cold blooded, and I respect it. His KD was undeniably spooky; By day three he was ranked just under Snip3down and above Frosty. During their bout with Splyce, he kept himself very composed and made several clutch plays that allowed his team to take one victory off of Splyce. Back To Where The Players Play For The Finals The big announcement out of NOLA was that the 2018 finals would be held at Dreamhack Atlanta 2018 this November. Not only will the HCS finals be featured, there is also $10,000 up for grabs in the form of a Halo 3 2v2 tournament. Me being one of the few people that was north of 30 years old in the venue this weekend, you best believe I will be there to cover it. Naturally I would like to see a good deal of these rosters keep their bands together, but there’s a lot of time between now and November. Congratulations to Splyce and everyone who came and gave so many incredible performances. See you all in Atlanta.